US Navy Ocean Surveillance Satellite to track and surveil ships at sea worldwide. Built by Naval Research Laboratory (#1, 2); Martin Marietta (#3 - 9). Launched 1976 - 1987. AKA: PARCAE;SSB;White Cloud. Status: Operational 1976. First Launch: 1976-04-30. Last Launch: 1987-05-15. Number: 14 . Gross mass: 700 kg (1,540 lb). NOSS detected the location of naval vessels using radio interferometry, and consisted of a main spacecraft and several subsatellites, linked by fine wires, several 100's of meters apart. NOSS-Subsat American military naval signals reconnaissance satellite. Detected the location of naval vessels using radio interferometry. Ocean Surveillance Launch Dispenser satellite built by Naval Research Laboratory (NRL) (#1, 2); (#3 - 9) for, USA. Launched 1976 - 1987. Family: Medium earth orbit, Naval SIGINT. Country: USA. Launch Vehicles: Titan, Atlas, Thor, Delta, Atlas E, Atlas F, Thorad SLV-2G Agena D, Atlas F/MSD, Atlas E/MSD, Atlas H, Titan 4, Titan 403A. Launch Sites: Vandenberg, Vandenberg SLC1W, Vandenberg SLC3W, Vandenberg SLC3E, Vandenberg SLC4E. Agency: USN. Bibliography: 172, 2, 278, 279, 6, 4955, 4956, 6740, 12886. 1983 February 9 - . 13:47 GMT - . Launch Site: Vandenberg. Launch Complex: Vandenberg SLC3E. LV Family: Atlas. 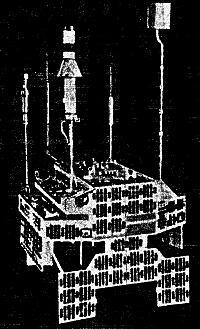 Launch Vehicle: Atlas H.
NOSS 4 - . Payload: PARCAE 5 / OPS 0252. Mass: 700 kg (1,540 lb). Nation: USA. Agency: USN. Class: Surveillance. Type: Naval SIGINT. Spacecraft: NOSS. USAF Sat Cat: 13791 . COSPAR: 1983-008A. Apogee: 1,186 km (736 mi). Perigee: 1,063 km (660 mi). Inclination: 63.40 deg. Period: 107.80 min. Ocean surveillance; aka White Cloud type spacecraft; Navy Ocean Surveillance Satellite; PARCAE..
SSB - . Payload: SSU. Mass: 700 kg (1,540 lb). Nation: USA. Agency: USN. Class: Surveillance. Type: Naval SIGINT. Spacecraft: NOSS. USAF Sat Cat: 13845 . COSPAR: 1983-008F. Apogee: 1,489 km (925 mi). Perigee: 733 km (456 mi). Inclination: 63.40 deg. Period: 107.42 min. SSD (NOSS 4) - . Payload: NOSS-Subsat 4-4. Nation: USA. Agency: USAF. Class: Surveillance. Type: Naval SIGINT. Spacecraft Bus: NOSS. Spacecraft: NOSS-Subsat. USAF Sat Cat: 13834 . COSPAR: 1983-008C. Apogee: 1,419 km (881 mi). Perigee: 796 km (494 mi). Inclination: 63.40 deg. Period: 107.42 min. Released from NOSS 4. .
SSA (NOSS 4) - . Payload: NOSS-Subsat 4-1 / OPS 0252 DEB. Nation: USA. Agency: USN. Class: Surveillance. Type: Naval SIGINT. Spacecraft Bus: NOSS. Spacecraft: NOSS-Subsat. USAF Sat Cat: 13835 . COSPAR: 1983-008D. Apogee: 1,164 km (723 mi). Perigee: 1,051 km (653 mi). Inclination: 63.50 deg. Period: 107.40 min. Released from NOSS 4..
SSC - . Payload: SSU. Nation: USA. Agency: USN. Class: Surveillance. Type: Naval SIGINT. Spacecraft Bus: NOSS. Spacecraft: NOSS-Subsat. USAF Sat Cat: 13874 . COSPAR: 1983-008H. Apogee: 1,173 km (728 mi). Perigee: 1,043 km (648 mi). Inclination: 63.50 deg. Period: 107.40 min. Released from NOSS 4..
SSA - . Payload: SSU. Nation: USA. Agency: USN. Class: Surveillance. Type: Naval SIGINT. Spacecraft Bus: NOSS. Spacecraft: NOSS-Subsat. USAF Sat Cat: 13844 . COSPAR: 1983-008E. Apogee: 1,166 km (724 mi). Perigee: 1,051 km (653 mi). Inclination: 63.40 deg. Period: 107.40 min. Released from NOSS 4..
1983 June 9 - . 23:23 GMT - . Launch Site: Vandenberg. Launch Complex: Vandenberg SLC3E. LV Family: Atlas. Launch Vehicle: Atlas H.
NOSS 5 - . Payload: PARCAE 6 / OPS 6432. Mass: 700 kg (1,540 lb). Nation: USA. Agency: USN. Class: Surveillance. Type: Naval SIGINT. Spacecraft: NOSS. USAF Sat Cat: 14112 . COSPAR: 1983-056A. Apogee: 1,167 km (725 mi). Perigee: 1,049 km (651 mi). Inclination: 63.40 deg. Period: 107.40 min. Ocean surveillance; aka White Cloud type spacecraft; Navy Ocean Surveillance Satellite; PARCAE..
GB2 - . Payload: SSU. Nation: USA. Agency: USN. Class: Surveillance. Type: Naval SIGINT. Spacecraft Bus: NOSS. Spacecraft: NOSS-Subsat. USAF Sat Cat: 14144 . COSPAR: 1983-056D. Apogee: 1,167 km (725 mi). Perigee: 1,049 km (651 mi). Inclination: 63.40 deg. Period: 107.40 min. Deployed from NOSS 5..
GB3 - . Payload: SSU. Nation: USA. Agency: USN. Class: Surveillance. Type: Naval SIGINT. Spacecraft Bus: NOSS. Spacecraft: NOSS-Subsat. USAF Sat Cat: 14180 . COSPAR: 1983-056G. Apogee: 1,166 km (724 mi). Perigee: 1,049 km (651 mi). Inclination: 63.40 deg. Period: 107.40 min. GB1 - . Payload: SSU. Nation: USA. Agency: USN. Class: Surveillance. Type: Naval SIGINT. Spacecraft Bus: NOSS. Spacecraft: NOSS-Subsat. USAF Sat Cat: 14143 . COSPAR: 1983-056C. Apogee: 1,167 km (725 mi). Perigee: 1,049 km (651 mi). Inclination: 63.40 deg. Period: 107.40 min. Deployed from NOSS 5..
1984 February 5 - . 18:44 GMT - . Launch Site: Vandenberg. Launch Complex: Vandenberg SLC3E. LV Family: Atlas. Launch Vehicle: Atlas H.
NOSS 6 - . Payload: PARCAE 7 / OPS 8737. Mass: 700 kg (1,540 lb). Nation: USA. Agency: USN. Class: Surveillance. Type: Naval SIGINT. Spacecraft: NOSS. USAF Sat Cat: 14690 . COSPAR: 1984-012A. Apogee: 1,172 km (728 mi). Perigee: 1,052 km (653 mi). Inclination: 63.40 deg. Period: 107.00 min. Ocean surveillance; aka White Cloud type spacecraft; Navy Ocean Surveillance Satellite; PARCAE..
JD2 - . Payload: SSU. Nation: USA. Agency: USN. Class: Surveillance. Type: Naval SIGINT. Spacecraft Bus: NOSS. Spacecraft: NOSS-Subsat. USAF Sat Cat: 14729 . COSPAR: 1984-012D. Apogee: 1,172 km (728 mi). Perigee: 1,052 km (653 mi). Inclination: 63.40 deg. Period: 107.00 min. Deployed from NOSS 6..
JD3 - . Payload: SSU. Nation: USA. Agency: USN. Class: Surveillance. Type: Naval SIGINT. Spacecraft Bus: NOSS. Spacecraft: NOSS-Subsat. USAF Sat Cat: 14795 . COSPAR: 1984-012F. Apogee: 1,172 km (728 mi). Perigee: 1,052 km (653 mi). Inclination: 63.40 deg. Period: 107.00 min. JD1 - . Payload: SSU. Nation: USA. Agency: USN. Class: Surveillance. Type: Naval SIGINT. Spacecraft Bus: NOSS. Spacecraft: NOSS-Subsat. USAF Sat Cat: 14728 . COSPAR: 1984-012C. Apogee: 1,172 km (728 mi). Perigee: 1,052 km (653 mi). Inclination: 63.40 deg. Period: 107.00 min. Deployed from NOSS 6..
1986 February 9 - . 10:06 GMT - . Launch Site: Vandenberg. Launch Complex: Vandenberg SLC3E. LV Family: Atlas. Launch Vehicle: Atlas H.
USA 15 - . Payload: PARCAE 8. Mass: 700 kg (1,540 lb). Nation: USA. Agency: USN. Class: Surveillance. Type: Naval SIGINT. Spacecraft: NOSS. USAF Sat Cat: 16591 . COSPAR: 1986-014A. Apogee: 1,166 km (724 mi). Perigee: 1,049 km (651 mi). Inclination: 63.00 deg. Period: 107.40 min. Ocean surveillance; aka White Cloud type spacecraft; Navy Ocean Surveillance Satellite; PARCAE..
USA 16 - . Payload: SSU. Nation: USA. Agency: USN. Class: Surveillance. Type: Naval SIGINT. Spacecraft Bus: NOSS. Spacecraft: NOSS-Subsat. USAF Sat Cat: 16624 . COSPAR: 1986-014E. Apogee: 1,161 km (721 mi). Perigee: 1,055 km (655 mi). Inclination: 63.00 deg. Period: 107.40 min. USA 18 - . Payload: SSU. Nation: USA. Agency: USN. Class: Surveillance. Type: Naval SIGINT. Spacecraft Bus: NOSS. Spacecraft: NOSS-Subsat. USAF Sat Cat: 16631 . COSPAR: 1986-014H. Apogee: 1,407 km (874 mi). Perigee: 817 km (508 mi). Inclination: 63.41 deg. Period: 107.44 min. USA 17 - . Payload: SSU. Nation: USA. Agency: USN. Class: Surveillance. Type: Naval SIGINT. Spacecraft Bus: NOSS. Spacecraft: NOSS-Subsat. USAF Sat Cat: 16625 . COSPAR: 1986-014F. Apogee: 1,165 km (723 mi). Perigee: 1,055 km (655 mi). Inclination: 63.00 deg. Period: 107.40 min. 1987 May 15 - . 15:45 GMT - . Launch Site: Vandenberg. Launch Complex: Vandenberg SLC3E. LV Family: Atlas. Launch Vehicle: Atlas H.
USA 22 - . Payload: PARCAE 9. Mass: 700 kg (1,540 lb). Nation: USA. Agency: USN. Class: Surveillance. Type: Naval SIGINT. Spacecraft: NOSS. USAF Sat Cat: 17997 . COSPAR: 1987-043A. Apogee: 1,179 km (732 mi). Perigee: 1,045 km (649 mi). Inclination: 62.90 deg. Period: 107.80 min. Ocean surveillance; aka White Cloud type spacecraft; Navy Ocean Surveillance Satellite; PARCAE..
USA 25 - . Payload: SSU. Nation: USA. Agency: USN. Class: Surveillance. Type: Naval SIGINT. Spacecraft Bus: NOSS. Spacecraft: NOSS-Subsat. USAF Sat Cat: 18025 . COSPAR: 1987-043H. Apogee: 1,178 km (731 mi). Perigee: 1,035 km (643 mi). Inclination: 62.60 deg. Period: 107.60 min. USA 24 - . Payload: SSU. Nation: USA. Agency: USN. Class: Surveillance. Type: Naval SIGINT. Spacecraft Bus: NOSS. Spacecraft: NOSS-Subsat. USAF Sat Cat: 18010 . COSPAR: 1987-043F. Apogee: 1,184 km (735 mi). Perigee: 1,046 km (649 mi). Inclination: 63.20 deg. Period: 107.90 min. USA 23 - . Payload: SSU. Nation: USA. Agency: USN. Class: Surveillance. Type: Naval SIGINT. Spacecraft Bus: NOSS. Spacecraft: NOSS-Subsat. USAF Sat Cat: 18009 . COSPAR: 1987-043E. Apogee: 1,170 km (720 mi). Perigee: 1,039 km (645 mi). Inclination: 63.40 deg. Period: 107.30 min.